D, and t must be modified to take this motion into account and d' must be added to the resulting values obtained for d. Also note that the values for K, Ft», D, and Mr must be selected to suit the particular portion of the operating cycle under consideration. 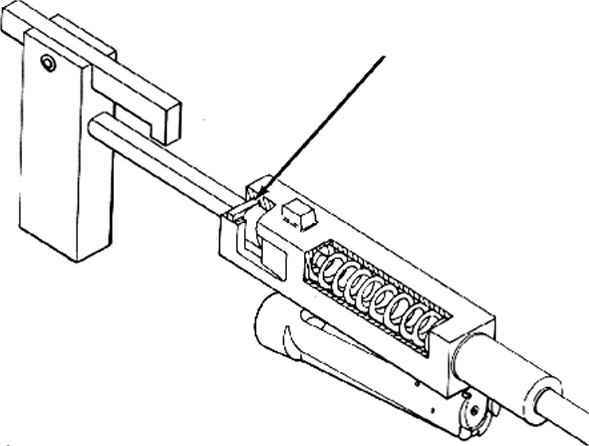 During recoil, both springs act on the total mass of the recoiling parts but in counter-recoil the barrel is returned to battery first while the bolt remains latched and then the bolt is returned. Thus it is necessary to consider the motions in three phases: recoil motion, barrel counter-recoil, and bolt return. This equation is employed to plot the displacement curve from the time t=0.010 until the bolt is latched at the rear. Since the design used as example allows for only a very slight overtravel, this overtravel will be neglected and it will be considered that the bolt is latched when the counter-recoil movement is equal to D (0.875 foot).